Many industries require an on-site cleanroom, but for many business owners, understanding all the rigid components demanded by the International Standards Organization can be confusing and overwhelming. Panel Built realizes this, and can offer you the knowledge and expertise on cleanroom designs, regulations and classifications to help you choose the right pressurized room for your plant. Because cleanrooms demand that air quality, temperature and humidity be highly regulated with repeatedly filtered air to protect sensitive equipment from dust particles, chemical vapors, airborne microbes and other low-level pollutants, many people believe they must be independently constructed of all hard walls and built from scratch. This is not necessary, and can end up being very costly, as well as permanent. Panel Built furnishes prefabricated non-metallic cleanrooms that meet all strict ISO standards, are less expensive than traditionally-built units, and are very attractive. 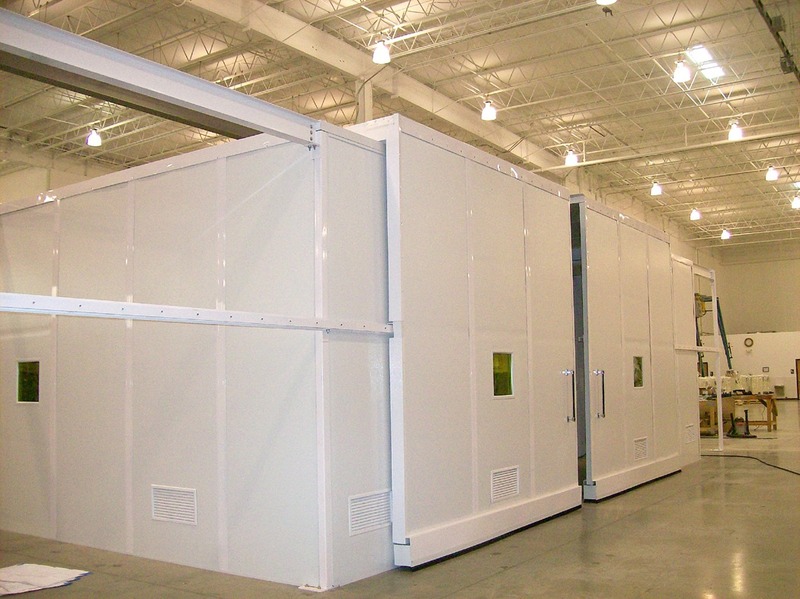 Perhaps the most advantageous feature of our modular cleanrooms is their expandability and portability. Panel Built’s modular designs allow for your original layout to easily expand without having to dismantle and start again from nothing. If your facility moves to a new location, our cleanrooms can be disassembled and moved with you. When building a cleanroom from scratch, a business owner needs to worry about all kinds of very strict regulations set by the ISO. Panel Built cleanrooms already have that taken care of for you. Each unit includes panels, windows and doors that already meet Class 100,000, Class 10,000 and Class 1,000 cleanroom classifications. Our units also contain hidden return air chase systems to continually filter the area of destructive impurities. The wall systems for modular cleanrooms are equipped with appropriately sized return louvers, saving you costly ductwork and/or chase walls that are often needed in hard wall cleanroom systems. The Panel Built staff has close working relationships with all our suppliers, which allows us to confidently promise that any and all specialty components needed for your cleanroom are available when you need them, and delivered when you want them. We supply your unit with sealed and gasketed light fixtures, drop ceilings and HEPA fan filters. We can provide you with everything you need to complete your cleanroom so it meets both your standards, as well as ISO regulations. If you require your first cleanroom, additional ones, or just want a much larger room than you originally had installed, but just don’t have the floor room for it, Panel Built is suggesting you look up. Vertical space is often overlooked as the valuable space that it is. 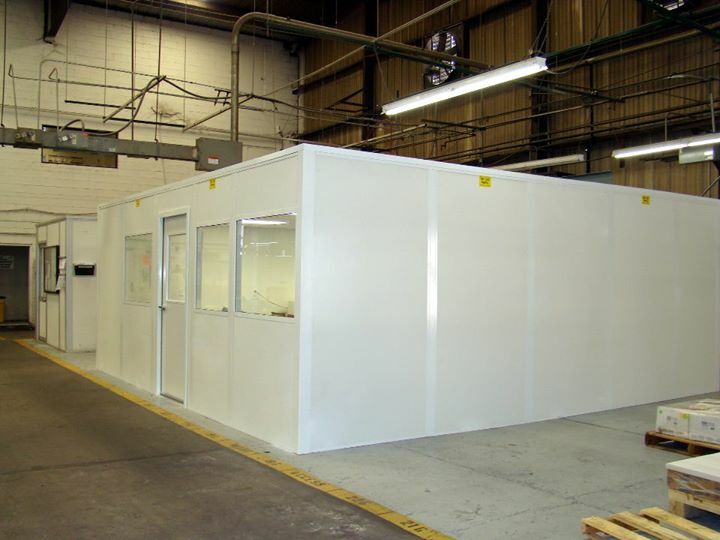 A modular cleanroom mezzanine is ideal for manufacturing plants with limited workspace. Our mezzanines are the answer to transforming wasted vertical space into productive work environments. Our modular mezzanines are heavy-duty load-bearing systems that can support two-story construction, and we provide all the prefabricated metal stairs and accessories needed. And just as we would with a ground-level cleanroom, we make sure your mezzanine cleanroom meets all stringent ISO standards. So You Want A Cleanroom – Now What? When you make the decision to purchase a cleanroom from Panel Built, you have made the decision to be well taken care of from start to finish. Our highly trained staff treats all our clients with the kindness and respect they deserve. We believe in working with our clients, taking the time to thoroughly discuss your cleanroom needs, and by designing a unit that meets federal specifications and one you can be proud of. We are happy to explain any regulations you don’t understand, and answer your every question. We also can specify, supply and install an HVAC system for your cleanroom, but if you already employ a mechanical contractor, we will gladly supply him with all the necessary information he will require to adequately design and supply it for you. If you need a cleanroom on your facility, all the standards and regulations can be quite daunting. The staff at Panel Built are professionals, and we realize you have enough to worry about. We guarantee the minute you contact us, we will focus on doing what we do best – so you can focus on what you do best.